The enhanced S-cone syndrome (ESCS) is a rare hereditary retinal degeneration that has enhanced short wavelength-sensitive cone (S-cone) functions. The longitudinal clinical course of this disease has been rarely reported, and the genetic aspects of ESCS have not been well investigated in the Japanese population. In this report, we present our clinical and genetic findings for 2 patients with ESCS. The patients were 2 unrelated Japanese men. Standard ophthalmic examinations and mutation screening for the NR2E3 gene were performed. Patient 1 was a 36-year-old man, and his clinical findings were typical of ESCS. His decimal best-corrected visual acuity (BCVA) was 1.0 OD and 0.5 OS after removal of cataracts. Genetic investigations revealed a homozygous truncation frameshift, the p.I307LfsX33 mutation. Patient 2 was an 11-year-old boy when he was first examined by us. His clinical findings were typical of ESCS except for uveitis in the left eye. His decimal BCVA at the age of 39 years was maintained at 1.5 in each eye, although the retinal degeneration and visual field impairments had progressed during the follow-up period. The genetic investigations revealed homozygous mutations of p.R104Q in the NR2E3 gene. The frameshift mutation, p.I307LfsX33, in the NR2E3 gene is a new causative mutation for ESCS. The clinical observations for patient 2 are the longest ever reported. The retinal degeneration caused by this mutation is slowly progressive, and these patients maintained good vision with maintenance of the foveal structure until their late thirties. 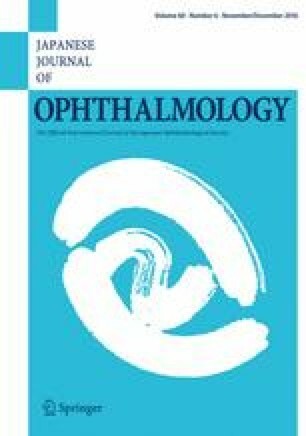 We thank the patients and their families for their kind participation in this study; Professor Kunihiko Shiraki and Doctor Kumiko Hirayama of Department of Ophthalmology and Visual Science, Graduate School of Medicine, Osaka City University, for providing precise clinical data on the parents of patient 1; Professor Emeritus Duco I. Hamasaki of the Bascom Palmer Eye Institute of the University of Miami, for his critical discussion and final manuscript editing. This research was supported in part by research grants from the Ministry of Education, Culture, Sports, Science and Technology, Japan [Grant-in-Aid for Scientific Research (C) 2546738] and the Japan Agency for Medical Research and Development (Practical Research Project for Rare/Intractable Diseases, 15ek0109072h0002 and 26310601). K. Kuniyoshi, None; T. Hayashi, None; H. Sakuramoto, None; H. Mishima, None; H. Tsuneoka, None; K. Tsunoda, None; T. Iwata, None; Y. Shimomura, None. Online Mendelian inheritance in man (OMIM). In: National Center for Biotechnology Information (NCBI), U.S. National Library of Medicine. 2016. http://www.ncbi.nlm.nih.gov/omim. Accessed 29 Apr 2016. PolyPhen (polymorphism phenotyping). 2012. http://genetics.bwh.harvard.edu/pph/data/. Accessed 29 Apr 2016. PolyPhen-2 (polymorphism phenotyping v2). 2016. http://genetics.bwh.harvard.edu/pph2/. Accessed 29 Apr 2016. SIFT. 2011. http://sift.jcvi.org/. Accessed 29 Apr 2016. Align GVGD. In: International Agency for Research on Cancer, World Health Organization. 2016. http://agvgd.iarc.fr/. Accessed 29 Apr 2016. LOVD v3.0 (Leiden Open Variation Database). 2016. http://www.lovd.nl/3.0/home. Accessed 29 Apr 2016. National Center for Biotechnology Information (NCBI). 2016. http://www.ncbi.nlm.nih.gov/. Accessed 29 Apr 2016. Human Gene Mutation Database (HGMD). 2016. https://www.qiagenbioinformatics.com/products/human-gene-mutation-database/. Accessed 29 Apr 2016. Human Genetic Variation Database (HGVD). 2016. http://www.genome.med.kyoto-u.ac.jp/SnpDB/. Accessed 29 Apr 2016.